How Much Do Football Pads Weigh? 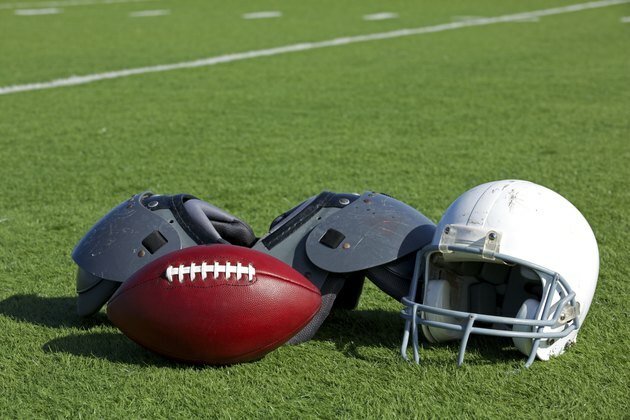 To minimize the risk of injury, nearly all organized football leagues require players to wear specialized pads and equipment. The exact weight of football pads varies based on the age level and position of the player, but for the average player, the combined weight is around 20 pounds. The shoulder pads and the helmet are the heaviest pieces of equipment. An adult helmet with a carbon steel facemask weighs between 3 and 5 pounds. The weight of the shoulder pads can vary depending on the player's position. Linemen and linebackers wear shoulder pads at the top range of about 6 pounds, while wide receivers and tailbacks wear lighter units of about 3 to 5 pounds that are more flexible. Quarterbacks often supplement the pads with an abdominal girdle that adds 2 or 3 pounds. For the lower body, players wear thigh pads and hip pads, and in some instances knee pads. The combined weight usually doesn't surpass 5 pounds.